Your home is the probably most important used page on your website. It can either grab your visitor’s attention or scare them away. What your homepage can do is direct your visitors to your converting pages. This could be information you provide or selling a product or service. Those are your most important pages, the homepage is used to push them there. Because of this it is important to put some extra time designing your homepage. Web designers put more time into the homepage than any other web page on the site. Why shouldn't they, it is the most unique page on the site. Your homepage's job is to get people off the homepage. It is important for a visitor to know what your web page is about when they visit. By summarizing your content into one place it encourages users to visit other pages. Giving your visitors the impression of what your site is about is a good start. The second phase is giving them a reason to stay. What can your website offer them? Content, information, or entertainment are the most likely answers. You only have a couple of seconds engage with them. If successful they will not only stay longer, they will dive deeper into your site. Quality content is the key. The better content you have the more visitors you are going to have. This goes for all pages. It doesn't matter if it's the homepage, category, or product/post page. Your content needs to be sharp across all areas. Your design can play a huge part in your aggregation point. You can have an "out of the box" design for your homepage, but there are some elements that are normal across the web. Such as having your navigation either at the top or at the left-hand side. Have a common font through the whole site and big enough to read. Watch the colors for background and text color. These are the most common elements in web design. These small easy fixes could change how your visitors interacts with your website. You have an optimized homepage and users are engaging. Congratulations! This is probably the hardest step. Now you need to manage your return users. When your visitor comes back to your site they will want to see something new. Try to add more content and information. Not only is this beneficial to your users, but also for search engine optimization. A website blog can help keep your content fresh. If you have an e-commerce​ website, give them deal banners or new product pictures. Your changes to your homepage should also reflex to an area you want your users to visit. 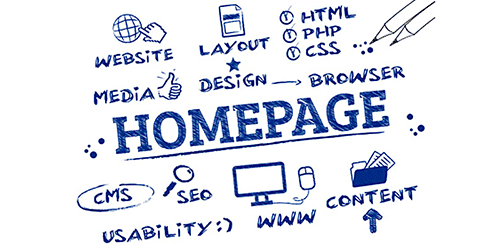 Now you know what a homepage is and how to make yours better. Doing some of these techniques could change the way your visitor interactions with your site. The goal of your website is to have people visit and use the resources you have. As a designer, try to think like a first time visitor. What is hard to find from the homepage, but you feel it beneficial. Once you think of something, make a change on your homepage for the users to go directly there. Great content, thanks for sharing such an informative article with us!!!!!!!!!! Great homepage tips. I like your blog.